Half way through the week already and only 15 days until the big day. December has really flown by. I am sure you will agree. Today we have Alice from Helloveloblog on the blog and she is kindly sharing with us her cycling experience. Alice is going to be on the blog over the next few weeks sharing her exercising experience ready for all those New Years Resolutions! It’s certainly true that you never forget how to ride a bike. If you’re reading this thinking you’d be interested in cycling again for fitness, to lose weight, to beat the traffic on your morning commute, or even as a hobby with family and friends then well done you! Cycling is a wonderful, social, healthy sport, that’s a lot kinder on the body than say running, and it can suit all levels. Whether you want to be the next Victoria Pendleton or you just want to do your own thing, cycling is very inclusive. I’m going to be doing a few posts over the next few weeks covering the basics of getting into cycling. I’m incredibly passionate about getting more women cycling, so I hope this inspires you to give it a go! I know this may seem a strange place to start, because you’re probably thinking you already know how to ride a bike, but I want to share with you a few tips and tricks I’ve learnt from my (many) biking years to help you really cycle efficiently, safely and smoothly. N.B this is not just aimed at those with whizzy road bikes. These skills apply to whatever bike you ride. STEP 1) Get the right gear: Gearing is something you learn over time until it becomes an instinctive change that you do simply by reading the road. The general rule is that the front gears (located near your right foot and pedal) are for the biggest shifts; such as dropping to your lowest gear for a big hill. You will have two or three gears to pick from here, with the smallest ring being the easiest to ride in. You can change up and down on the front gears by shifting the mechanism on the left hand side of your handlebars. The back gears (which you’ll find on the cog within your back wheel) are your precision gears used to alter pace or make pedalling a bit easier when it feels tough. These are changed using the mechanism on the right hand side of your handlebars. The best way to use your gears effectively is to practice moving up and down on the front and back. Also try to pre-empt a gear change by reading the road and the terrain. If it looks like a hill is coming your way, change down accordingly in advance so you’re not doing it when you hit the gradient. This causes you to lose speed and puts pressure on the chain stopping it from dropping in to gear smoothly. STEP 2) Brake safely: The thing with braking is to apply even pressure on the brakes every time you use them. The front brake (on the left side of you handlebars) provides the most amount of stopping power, so you’ll find if you pull this on too hard you’ll be flying over the handlebars. Similarly, over-gripping the back brake could cause the back tyre to skid. Keep the pressure gentle and even, and just like gearing, pre-empt stopping or slowing down so you moderate your speed accordingly. STEP 3) Look where you want to go: I do a lot of mountain biking, and when I was learning, I was told ‘if you look at that tree you’ll crash in to it’ – look where you want to go rather than at what you want to avoid. The same applies on the road. Your bike will go where you are looking, so always look ahead, down the road and through corners rather than in to them. STEP 4) Descend downhill safely: Descending confidently takes practice and conviction, but the best way to be safe is to control your speed by even braking and by keeping your body weight over the back wheel. If the downhill is particularly steep push your bum to the back of the saddle and keep your chest low to the handlebars as this helps maintain traction over the rear of the bike. Also, don’t look directly in front of the bike, look up and ahead so you can read the road, just as you would driving a car. STEP 5) Be smooth as you turn the pedals: Think about turning your feet in circles, rather than an up and down motion. You need to apply force throughout the stroke to get the maximum benefit. This is helped by having cleats, or ‘clipped in pedals and shoes’. (I’m happy to offer advice on these if anyone’s interested! STEP 6) Practice: Basically ride in all weathers (yes, even the damp, cold stuff) and ride on all terrains. You will massively improve your bike handling skills by riding off road (cross country mountain biking) or on gravel trails, and even more so if you learn to ride in the rain. Your speed will need to be much slower in these conditions, but you’ll quickly learn how to navigate obstacles, pebbles, sticks, fallen leaves etc. which will benefit you on the road. STEP 7) Be seen in traffic: Maintain your position on the road, don’t weave in and out of traffic, make sure you are visible, and most importantly make eye contact with drivers. It goes without saying you should also obey all traffic signs, traffic lights and use arm signals to indicate which direction you wish to travel in. 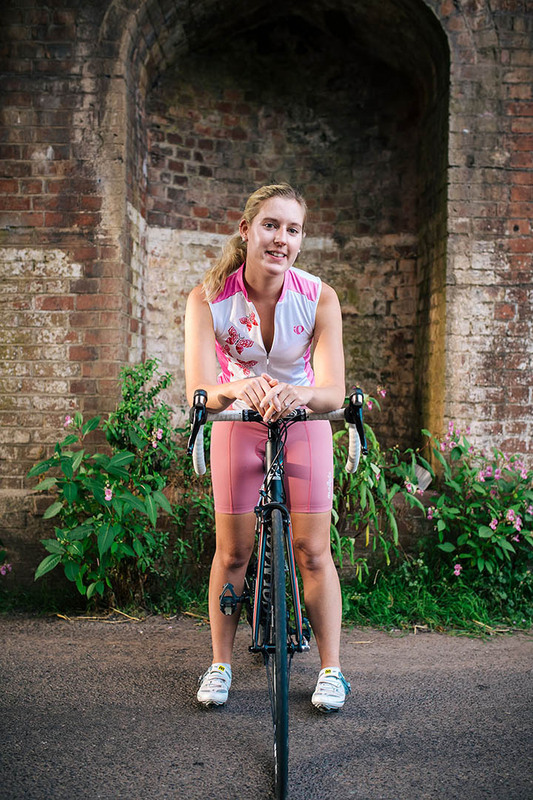 Alice is in her mid-20s and has cycled all her life. She comes from a massive cycling family and rides and completes in all cycling disciplines including road racing, mountain biking, indoor track cycling and club rides. ABOUT ALICE…. She has recently sent up a cycling club for women and novice riders in Somerset, and also writes for Hello Velo – her women’s cycling blog. Be:Fit London - Pick Up Everything You Need to Stay Fit & Healthy all in One Place.